to those we love how much we appreciate them. At least that's always my been my take on it. So, if I may, I'd like to take a moment to express my gratitude. I'd like to thank each and every one of you who read my blog or Page, for being supportive and encouraging to me. For letting me know that you appreciate what I am creating and putting out into the world. Working as an artist and designer, on my blog and Page, and in my creative business, is a way of expressing myself, putting myself out into the world. And anytime any one of us does that, we risk rejection, or even just realizing that no one 'gets' us. As an artist, I find one of the most satisfying things is to know your work has touched a chord with someone, made them happy in some way, or made some kind of difference. So I was amazed, and ever so grateful, to realize that I had not only succeeded in creating something that people responded to, but that there were others who also joined me in my mission of creating peaceful, positive change, and wanted to share. To all my fans and followers, friends and family and all the kind people who have supported or just connected with me here, I thank you. 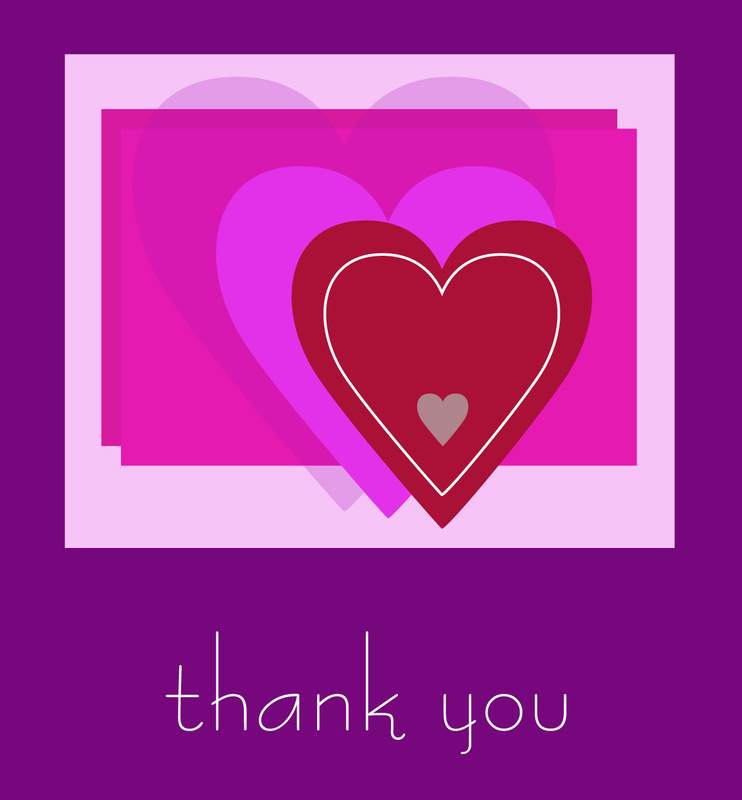 Art, creativity and good intentions are nothing if not shared, and your interactions have made my life a bit sweeter. Please allow me to express, from the bottom of my heart, my appreciation of YOU. Thanks for being here. I was afraid no one would read my blog, either. I didn't even share it with my real life friends until recently. I just found yours and look forward to reading more. @Jen - glad you put yourself out there - good for you! and I look forward to hearing more from you! thanks so much for your comment Jen! dear Savira - it seems, then, that we have had the very same thoughts of each other - as I find you to be a beautiful person and am so glad I found you, too. Your insights and authenticity are such a breath of fresh air! much gratitude! Don't write letter for a long time. Anyway, it look good. Thanks! @madhu - thanks, especially then, for writing here! What a wonderful Valentine to your supporters and followers. By the way, your recent comments on YogaSavy's blog are so insightful. I enjoy reading your posts and am glad I discovered you. I agree with what you say about art, creativity and good intentions NOT being shared. That is why for years I have shared my poetry with the people I write it for or about, be they members of my family, my friends, or simply strangers whose presence or comments gave me ideas for poems. The last poem I wrote for a "stranger" was written on an airplane on December 2, 2010 for a young woman who was sitting next to me. I wrote a sonnet about her laptop being so organized with many folder icons and about how enjoyable it was meeting and talking with her. I finished it while waiting at the luggage carousel after deplaning, and I gave it to her just a few minutes before her luggage came down the chute and she departed from my life and from the terminal. @ MikeB-thank you very much for all your kind comments, and re: YS's blog. Love you poetry story! I have noticed your couplets on YogaSavy's blog - and enjoy how some are light and playful, while others, have moved me; I'm impressed by how much emotion you convey in so few lines! I'm happy and grateful to have you here! What a beautiful blog you have here! Thanks for also following mine. Since I recently finished writing 365 Lessons for 2010, I haven't been on the internet as often. I'm happy to find your blog here! Keep it up, it's wonderful! "Art, creativity and good intentions are nothing if not shared" Yes, what you say is sooo true! This is what we need in the world today. Thank you for sharing! @Katherine J- My pleasure to share! - and thanks so much for all your sweet comments! And I encourage others to check out your book and blogs; think you are talented writer! so, Welcome! - So happy to have you here! Thanks for your kind words about my couplets. That deserves a . . . . a . . . . a couplet! I will write one for you soon. Right now, I have to get to sleep.